A Payroll Accountant may deal with various duties but the most vital job duty is to process payments to the employees in a timely and effective manner. 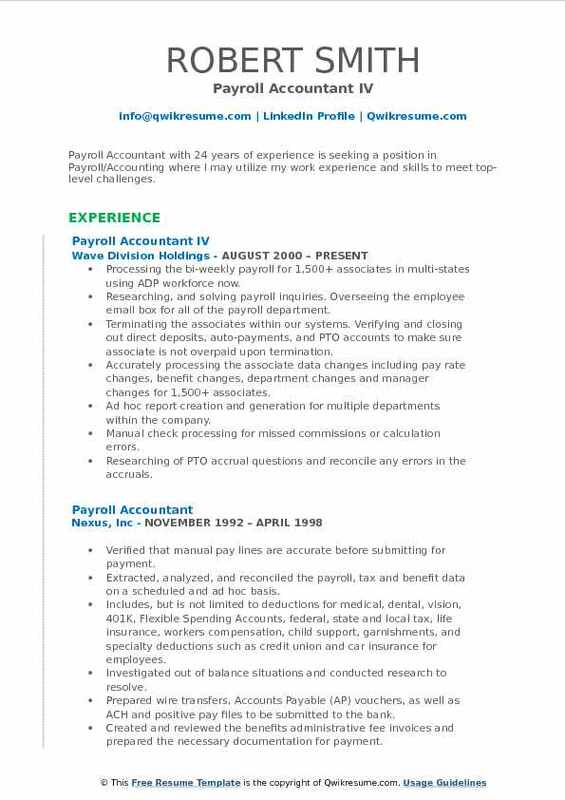 Some of the other primary duties that are incorporated in the Payroll Accountant Resume include – ensuring paychecks are accurate, correct and delivered on time, preparing tax reports, calculating salary and overtime, updating fresh hires and terminations from the payroll system database, making transactions of all entries and handling accounting duties as assigned, making suggestions to improve payroll system, making appropriate tax deductions and ensuring that the standard accounting rules are practiced. Candidates seeking to make a career in this line of accounting operation should to the minimum possess a good understanding of math and accounting skills and have proficiency in handling the payroll related software. While a degree in accounting may be sufficient to embark on this entry-level position, embracing a professional certification may boost payroll accountant’s career and prospects. Summary : Detail-oriented, Payroll Accountant with 19 years of experience in the Education domain, with excellent analytical skills and experience with benefits and payroll administration. Energetic, reliable and skilled with working with a diverse group of people. I am also driven by a motivation to perform beyond expectations. Dedicated to refined computer skills and strong ability to assist in efficient company operations. Resolving and responding to the problems or inquiries made regarding calculations, preparation, payments, and adjustments related to payroll. Managing effective vendor relationships and liaisons with outside payroll service providers. Preparing and maintaining all payroll information, including hours, rates, etc., for the outside payroll processor. Reviewing payroll reports to verify the correctness of the payroll and preparing it for management approval. Ensuring that withholdings and deductions associated with net pay are computed properly. Setting up new employees, benefits, locations, and direct deposit requests in the payroll system within the specified time frame. Preparing, organizing, reviewing, and submitting forms associated with federal, state and local authorities, such as W-2s, 1099s, W-9s. Providing related accounting accruals for month-end closing, detailed analyses and work paper preparation related to the various payroll related activity. Reconciling and analyzing the general ledger accounts and balances related to payroll as required. Preparing commission payment calculations for management approval and payment. 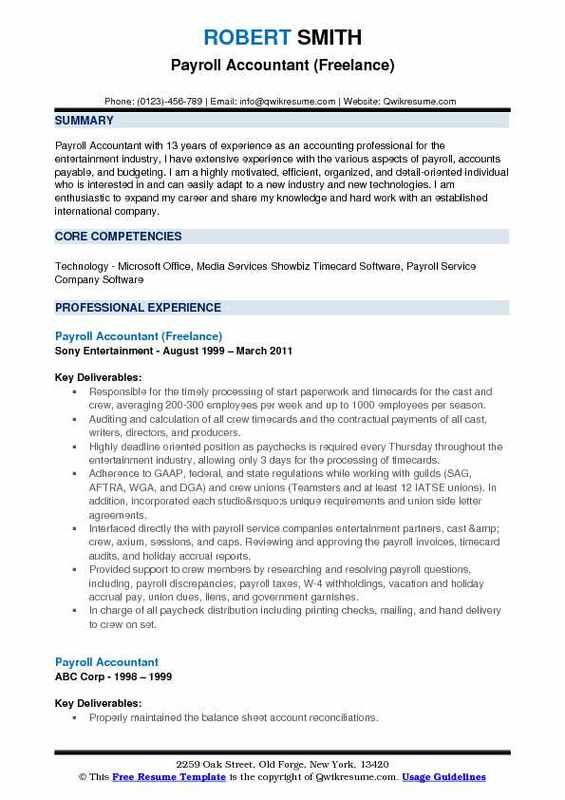 Summary : Payroll Accountant with 13 years of experience as an accounting professional for the entertainment industry, I have extensive experience with the various aspects of payroll, accounts payable, and budgeting. I am a highly motivated, efficient, organized, and detail-oriented individual who is interested in and can easily adapt to a new industry and new technologies. I am enthusiastic to expand my career and share my knowledge and hard work with an established international company. Responsible for the timely processing of start paperwork and timecards for the cast and crew, averaging 200-300 employees per week and up to 1000 employees per season. Auditing and calculation of all crew timecards and the contractual payments of all cast, writers, directors, and producers. Highly deadline oriented position as paychecks is required every Thursday throughout the entertainment industry, allowing only 3 days for the processing of timecards. Adherence to GAAP, federal, and state regulations while working with guilds (SAG, AFTRA, WGA, and DGA) and crew unions (Teamsters and at least 12 IATSE unions). In addition, incorporated each studio’s unique requirements and union side letter agreements. Interfaced directly the with payroll service companies: entertainment partners, cast & crew, axium, sessions, and caps. Reviewing and approving the payroll invoices, timecard audits, and holiday accrual reports. Provided support to crew members by researching and resolving payroll questions, including, payroll discrepancies, payroll taxes, W-4 withholdings, vacation and holiday accrual pay, union dues, liens, and government garnishes. In charge of all paycheck distribution including printing checks, mailing, and hand delivery to crew on set. Assisted lead accountant, supervising producer, and unit manager with budgets, cost analysis, and cost projections. Summary : Payroll Accountant with 11 years of experience in the Healthcare domain is seeking a position in Payroll/Accounting that will utilize my skills and experiences while providing for professional growth and career advancement. Skills : ADP Workforce Now, ADP PayeXpert, ADP PCPW, ADP ETIME, ADP Report Writer, Workday Time And Attendance, Microsoft Dynamics AX/Great Plains, DDS, FRx, FAS 2000, QuickBooks, MAS 90, Excel, Word, Concur, ExpenseWire, ProBusiness, Fidelity, Equity Edge. Responsible for accurate and timely processing of multi-state bi-weekly payroll for U.S and Canada consistent with federal, state, and local wage and hour laws including compliance with Corporate Policies and Sarbanes Oxley. 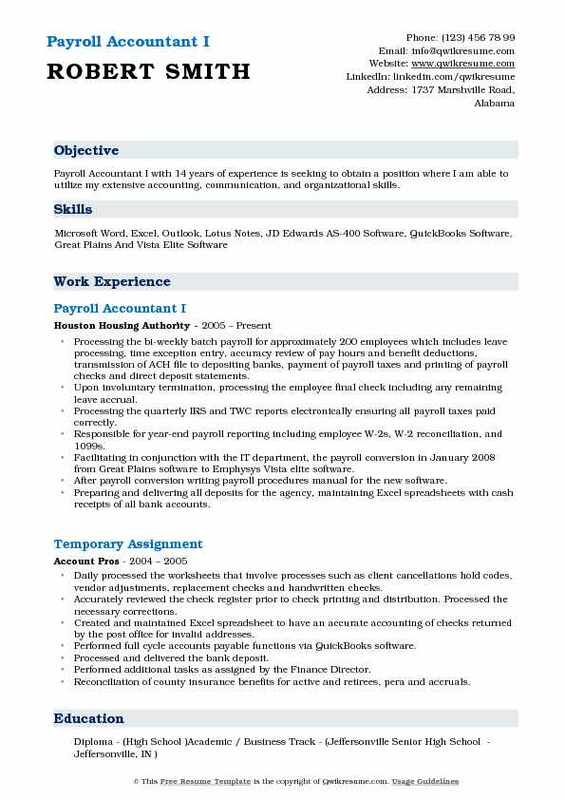 Prepared the payroll journal entries, monthly accruals and payroll/benefit account reconciliation. Prepared and transmitted fidelity 401(K) contribution and distribution files. Processed US and Canada stock reporting to ensure all stock transactions were reported timely and accurately. Researched and registered new tax jurisdictions for payroll tax filings. Balanced payroll accounts by auditing information, identified and resolved discrepancies. Reconciled quarterly and annual payroll tax filings and prepared amendments as required. Prepared audit & tax schedules, headcount report and provided support to external auditors during quarter-end and year-end audit. Extensively used the ADP report writer with expertise in exporting reports to excel. Developed excellent working relationships and communication with the HR and Finance team. Assisted with the internal SOX audits and external quarterly review and audits. 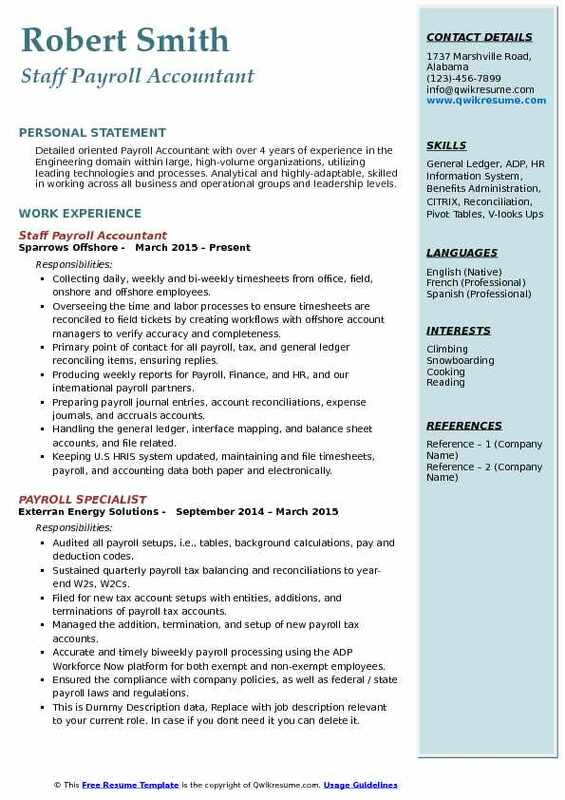 Summary : Payroll Accountant with 24 years of experience is seeking a position in Payroll/Accounting where I may utilize my work experience and skills to meet top-level challenges. Skills : Oracle, ADP Workforce Now, ADP eTime, Workday HRIS, Replicon timekeeping software, Quickbooks, Microsoft Office Suite, Word, Excel, Outlook, and PowerPoint. Processing the bi-weekly payroll for 1,500+ associates in multi-states using ADP workforce now. Researching, and solving payroll inquiries. Overseeing the employee email box for all of the payroll department. Terminating the associates within our systems. Verifying and closing out direct deposits, auto-payments, and PTO accounts to make sure associate is not overpaid upon termination. Accurately processing the associate data changes including pay rate changes, benefit changes, department changes and manager changes for 1,500+ associates. Ad hoc report creation and generation for multiple departments within the company. Manual check processing for missed commissions or calculation errors. Researching of PTO accrual questions and reconcile any errors in the accruals. Troubleshooting the payroll process for ways to improve production. Providing the administrative support for Senior Management of HR and Accounting. 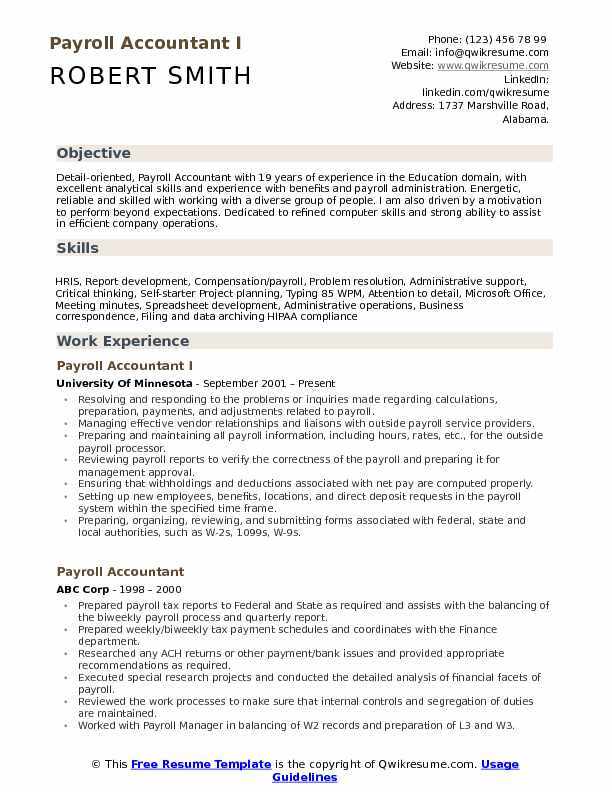 Objective : Detailed oriented Payroll Accountant with over 4 years of experience in the Engineering domain within large, high-volume organizations, utilizing leading technologies and processes. Analytical and highly-adaptable, skilled in working across all business and operational groups and leadership levels. Collecting daily, weekly and bi-weekly timesheets from office, field, onshore and offshore employees. Overseeing the time and labor processes to ensure timesheets are reconciled to field tickets by creating workflows with offshore account managers to verify accuracy and completeness. Primary point of contact for all payroll, tax, and general ledger reconciling items, ensuring replies. Producing weekly reports for Payroll, Finance, and HR, and our international payroll partners. Preparing payroll journal entries, account reconciliations, expense journals, and accruals accounts. Handling the general ledger, interface mapping, and balance sheet accounts, and file related. Keeping U.S HRIS system updated, maintaining and file timesheets, payroll, and accounting data both paper and electronically. Point of contact for ADP employee portal navigation, troubleshooting, and resetting. Leading the implementation and training of office staff and management when converting our payroll. Summary : Payroll Accountant I with 14 years of experience is seeking to obtain a position where I am able to utilize my extensive accounting, communication, and organizational skills. Processing the bi-weekly batch payroll for approximately 200 employees which includes leave processing, time exception entry, accuracy review of pay hours and benefit deductions, transmission of ACH file to depositing banks, payment of payroll taxes and printing of payroll checks and direct deposit statements. Upon involuntary termination, processing the employee final check including any remaining leave accrual. Processing the quarterly IRS and TWC reports electronically ensuring all payroll taxes paid correctly. 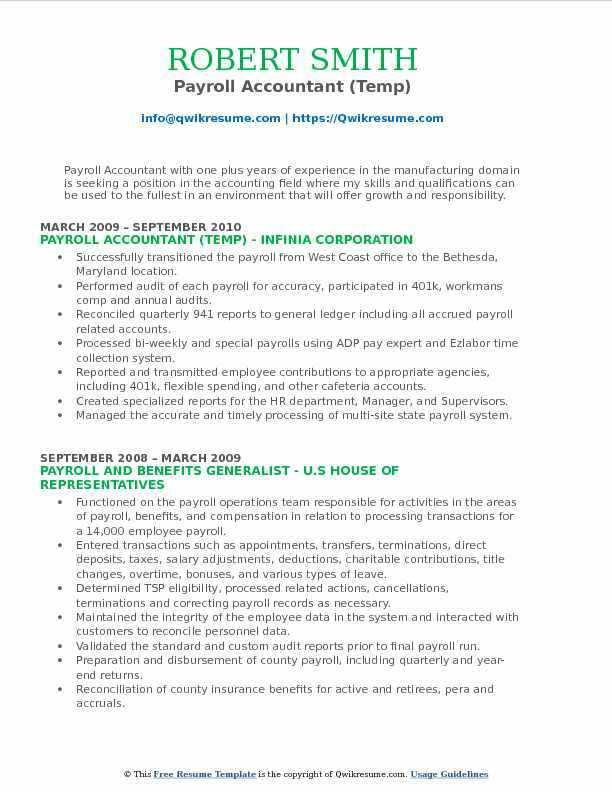 Responsible for year-end payroll reporting including employee W-2s, W-2 reconciliation, and 1099s. Facilitating in conjunction with the IT department, the payroll conversion in January 2008 from Great Plains software to Emphysys Vista elite software. After payroll conversion writing payroll procedures manual for the new software. Preparing and delivering all deposits for the agency, maintaining Excel spreadsheets with cash receipts of all bank accounts. Maintaining the reconciliation of flexible spending account deductions daily. 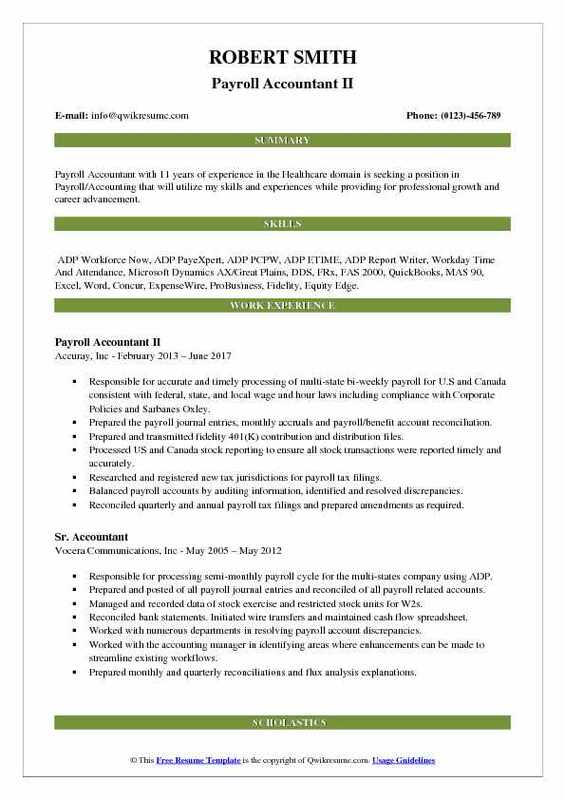 Acting as a second back up to Accounts Payable Accountant when on vacation. 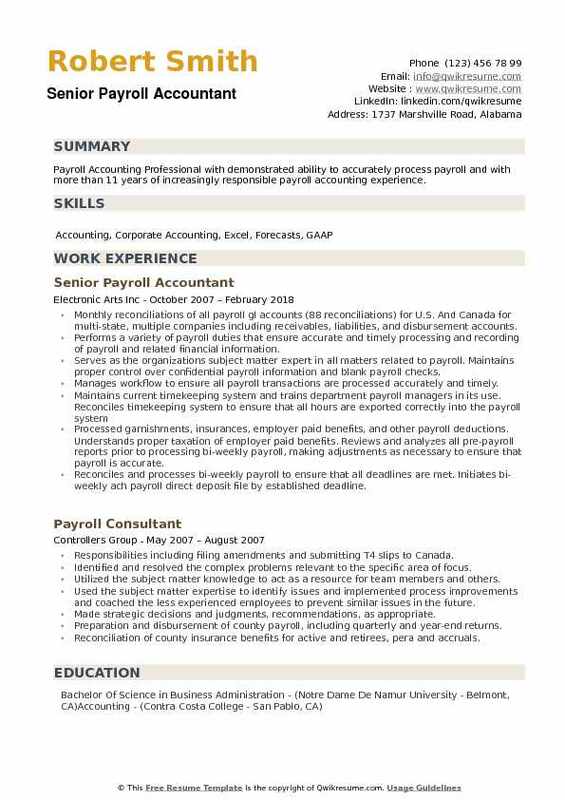 Objective : Payroll Accountant with one plus years of experience in the manufacturing domain is seeking a position in the accounting field where my skills and qualifications can be used to the fullest in an environment that will offer growth and responsibility. Skills : Payroll Management, Invoices/Expense Reports, Microsoft Office, Vendor Negotiations, Records, Organization & Management, Journal Entries & General Ledger, Spreadsheets & Accounting Reports, Cash Management. Successfully transitioned the payroll from West Coast office to the Bethesda, Maryland location. Performed audit of each payroll for accuracy, participated in 401k, workman's comp and annual audits. Reconciled quarterly 941 reports to general ledger including all accrued payroll related accounts. Processed bi-weekly and special payrolls using ADP pay expert and Ezlabor time collection system. Reported and transmitted employee contributions to appropriate agencies, including 401k, flexible spending, and other cafeteria accounts. Created specialized reports for the HR department, Manager, and Supervisors. Managed the accurate and timely processing of multi-site state payroll system. Reduced error rate and eliminated duplicate processes resulting in shorter payroll processing time and cost-savings. Implemented quarterly internal audits to ensured the integrity of payroll. Reduced payroll cost by renegotiating invoice rates with 3rd party payroll provider. Summary : Payroll Accountant III with 21 plus years of experience in the Education domain is seeking to obtain a rewarding full-time position with a well-established company that can offer continual challenges and opportunities. Responsible for preparing and processing payroll using the Paycor payroll system for approximately 149 employees. To include but not limited to: reviewing time cards for accuracy, communicating and assisting department managers in making necessary changes to time cards. Obtaining the Manager's approval on all-time cards, entering any manual deductions, bonuses etc., entering any new employee garnishments into the payroll system. Processing all necessary payroll reports. Responsible for processing all inner company invoices, monthly, quarterly, and as necessary. Responsible for creating reconciliation reports at month end, fiscal year end, and at the calendar year end for 401k, benefits, expense accounts, etc. Running all necessary reports and assisting in the workers' compensation audit, 401k benefit audit, and the RT6 - Florida unemployment audit annually. Responsible for paying the dental, life & disability liability insurance for multiple vendors monthly. Responsible for preparing and keying multiple journal entries, weekly, monthly and as necessary. Responsible for ensuring that third party sick pay is calculated correctly and entered into the Paycor system at the calendar year end. Responsible for computing and entering the life insurance amounts for employees that exceed 50k at the year-end. 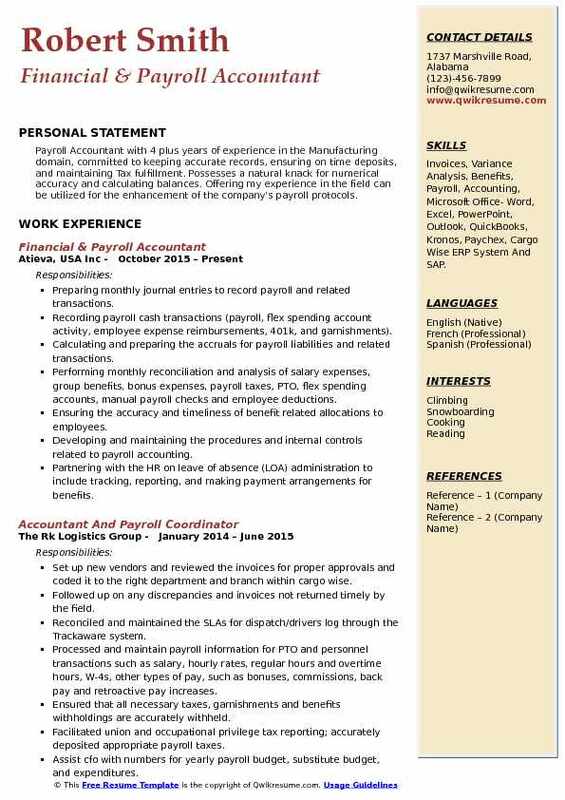 Objective : Payroll Accountant with 4 plus years of experience in the Manufacturing domain, committed to keeping accurate records, ensuring on time deposits, and maintaining Tax fulfillment. Possesses a natural knack for numerical accuracy and calculating balances. Offering my experience in the field can be utilized for the enhancement of the company's payroll protocols. Skills : Invoices, Variance Analysis, Benefits, Payroll, Accounting, Microsoft Office- Word, Excel, PowerPoint, Outlook, QuickBooks, Kronos, Paychex, Cargo Wise ERP System And SAP. Preparing monthly journal entries to record payroll and related transactions. Recording payroll cash transactions (payroll, flex spending account activity, employee expense reimbursements, 401k, and garnishments). Calculating and preparing the accruals for payroll liabilities and related transactions. Performing monthly reconciliation and analysis of salary expenses, group benefits, bonus expenses, payroll taxes, PTO, flex spending accounts, manual payroll checks and employee deductions. Ensuring the accuracy and timeliness of benefit related allocations to employees. Developing and maintaining the procedures and internal controls related to payroll accounting. Partnering with the HR on leave of absence (LOA) administration to include tracking, reporting, and making payment arrangements for benefits. Tracking and resolving the payroll related issues particularly during year end. Acting as the first point of contact with employees to validate, correct, and process application information. Summary : Payroll Accounting Professional with demonstrated ability to accurately process payroll and with more than 11 years of increasingly responsible payroll accounting experience. Monthly reconciliations of all payroll gl accounts (88 reconciliations) for U.S. And Canada for multi-state, multiple companies including receivables, liabilities, and disbursement accounts. Performs a variety of payroll duties that ensure accurate and timely processing and recording of payroll and related financial information. 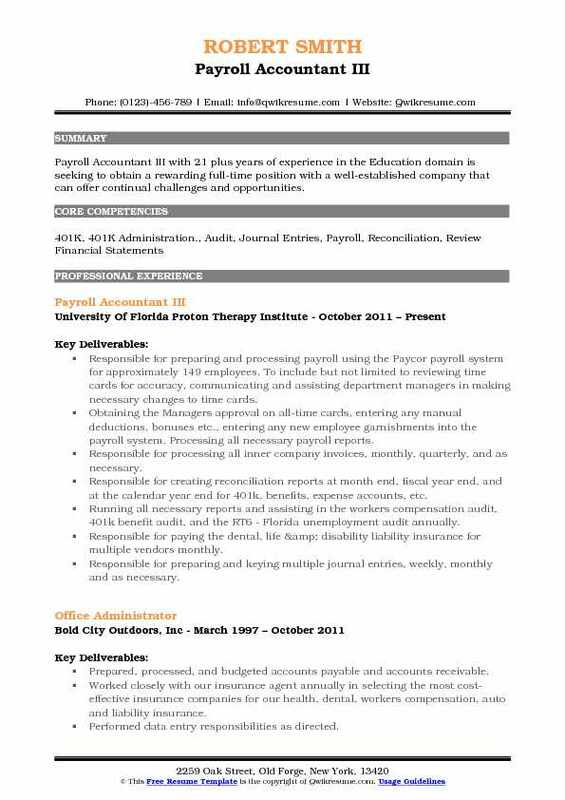 Serves as the organizations subject matter expert in all matters related to payroll. Maintains proper control over confidential payroll information and blank payroll checks. Manages workflow to ensure all payroll transactions are processed accurately and timely. Processed garnishments, insurances, employer paid benefits, and other payroll deductions. Understands proper taxation of employer paid benefits. Reviews and analyzes all pre-payroll reports prior to processing bi-weekly payroll, making adjustments as necessary to ensure that payroll is accurate. Reconciles and processes bi-weekly payroll to ensure that all deadlines are met. Initiates bi-weekly ach payroll direct deposit file by established deadline. Prepares and distributes payroll checks and required payroll reports schedules. Reviews and analyzes final payroll reports as necessary. Assembled and requests payment of garnishments, donations, health and dental, life insurance, and disability payments generated by payroll deductions. Verified the accuracy of payroll information for state and federal reporting and compliance (941s, w2s, vec, etc).